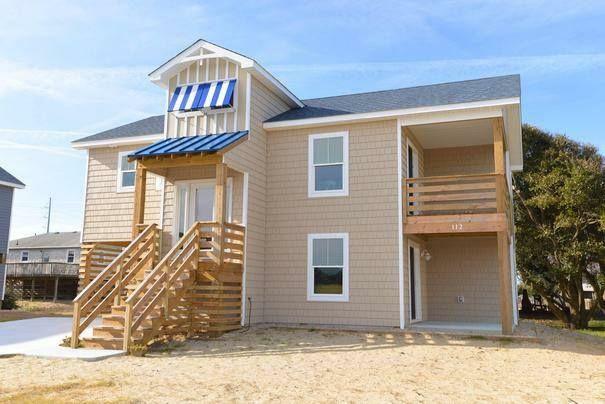 Beautifully decorated & a great location within easy walking distance of the Beach make this new home an excellent choice for fun & relaxation on the Outer Banks. Spacious & well equipped with an open living/dining/kitchen area on the top floor & separate den on the ground level, this home is perfect for the family vacation & is convenient to area shops, dining & attractions including the Wright Brothers National Monument. Built to the highest standard this lovely home features bright, beachy colors, hardwood floors, stainless steel appliances, ground level patio & a covered porch. Located in a quiet neighborhood that is perfect for biking or taking a stroll down to the Beach (approximately 500 feet to beach access at Ashville Street) this home also has views of the Wright Brothers Monument. -Ground Level: Parking for 3 Cars, Covered Entry to Home, 3 Bedrooms (1 w/Queen & TV; 1 w/Duo Bunk), Full Bath, Den w/TV, Laundry Area, Patio, & Enclosed Outside Shower. -Top Level: Living/Dining/Kitchen Area, Flat Screen TV, Hardwood Floors, Half Bath, Master Suite w/King, TV, & Full Bath w/Tiled Shower, & Covered Deck.